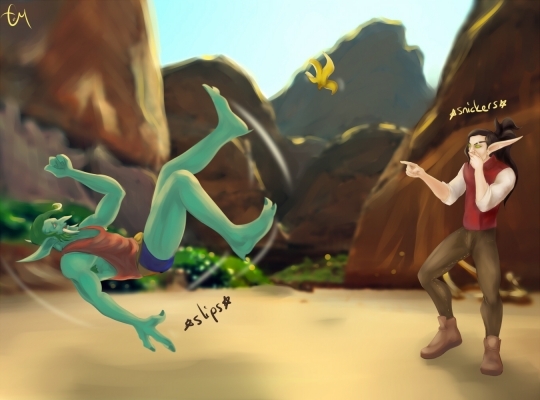 My piece of latest Azeroth Art Exchange for Fool's Day. It depends on the type of commission... -Eg. if this is a character design or character related project, I'd like to know their personality. Knowing their background, their personal values and their possible reactions helps me to pull off the right expressions and the right stance. And yes, I ask for references. Picture references are most welcome but text references are good too. If the commissioner can't provide picture references, they should be as definitive as one can be. Surroundings, body types, clothes etc... Details are important! Time restriction or deadline? -Eg. it can be a gift and the time can be limited; I need to be warned in advance. I try my best to deliver my commissions in time but life happens sometimes. To prevent any disturbance, better be clear from the beginning to the end. -The prices I've set in September 2014 can be found here; http://tinyurl.com/emcommishes -Delivery time varies. Just to be safe, I usually tell my commissioners to wait 1 or 2 weeks for final product after first rough sketch. -The art commissions I do with this pseudonym are NOT allowed for commercial use.